The BJP central leadership today asked the party Chief Ministers to focus on providing incentives and disincentives to bring the population under control and lay a greater stress on infrastructural development in their respective states. The Union Information and Broadcasting Minister, Mr Jaipal Reddy, today accused a former Deputy Prime Minister, Mr L.K. Advani, of misusing the office of the Home Minister and charged the BJP with double standards on the issue of “tainted ministers”. Having realised that he had bitten more than he can chew, Telangana Rashtra Samithi (TRS) leader and Union Minister K. Chandrasekhar Rao today expressed his regret over his remarks made on Friday against Congress chief Sonia Gandhi. A special court has ordered the return of goods recovered from R.K. Gupta, who was booked under the NDPS act, to his family members. The police had recovered five credit cards, a Tata Indica car, Rs 25,000 and a mobile phone from Gupta at the time of his arrest on August 13. The Telugu film industry bigwigs met Chief Minister Y. S. Rajasekhara Reddy here today to seek his intervention for stopping rampant piracy that has been crippling the second biggest film industry in the country. Organisers of Ganpati pandals in Maharashtra have split on political lines on the eve of the elections in the state. A majority of states have joined in protest against environmental clearance proposals, saying these were contrary to the Centre’s principles of decentralisation and not speedy enough to ensure quick development. The process to elect the 60-member Arunachal Pradesh Assembly will be set in motion on Monday with the Governor issuing the notification for the poll on October 7. The seventh round of secretary-level talks of the Joint Committee of Experts (JEC) on sharing of waters of the Teesta and six other rivers between India and Bangladesh will take place in Dhaka from September 13 to 16. Thackeray speaks for Uma Bharti. A six-month-old baby weighs 15 kg. Country's first fully animated movie all set for an early release. On the political front, the party high command asked the Chief Ministers to consolidate the party’s constituency by reaching out to and making use of the party cadre to take feedback at regular intervals about their respective government’s performance and adopt necessary correctives. Attacking the BJP’s critics for viewing the problems of population explosion from a “communal angle” and focusing on the “failure” of Manmohan Singh-led UPA government to assess the dangers of illegal Bangladeshi immigration, former Deputy Prime Minister L.K. Advani warned about illegal Bangladeshi immigration being a major threat to the national security. Stating that any demographic imbalance will put pressure on the nation and its infrastructure, BJP President M. Venkaiah Naidu asked the BJP-led governments to provide incentives and disincentives to arrest the population explosion. “If anybody expresses concern about the increasing population, it is viewed as a crime....Anybody who ignores or glosses over the population growth was only doing a disservice to the nation,” Mr Naidu said at the conclave attended by the Chief Ministers of Gujarat, Rajasthan, Madhya Pradesh, Chhattisgarh, Jharkhand and Goa. BJP’s ministerial representatives from Orissa, where to BJD heads the coaliation, were also present. Mr Naidu said the BJP had an “open mind” on the population issue and was ready to interact with anyone if they had any contrary view on the issue. “Strengthening the nation, economy, and security by providing the people a good standard of living was the concern of the party,” he said, adding that it could be achieved only if population was checked and there should be efforts to bring the poor to follow the small-family norm. On the ideological front, Mr Advani asserted that the policy of “cultural nationalism” was the party’s strength about which “we should not be apologetic”. He also attacked the BJP’s critics for viewing the problems of population explosion and the ‘Tricolour’ issue from a communal angle. He accused the Manmohan Singh government of not paying adequate attention to national security and criticised its decision to repeal POTA while lifting the ban on the People’s War Group (PWG). “When we talk of nationalism and agitations like the “Tiranga Yatra” undertaken by Uma Bharti and another on the Veer Savarkar issue by Ms Sushma Swaraj, there is one section which feels that it is not right,” he said. “They dub it as jingoism,” Mr Advani told the conference which deliberated on the issues of governance, challenges, centre-state relations, population and preservation of cultural heritage. Emphasising that cultural nationalism was the “forte” of the Jan Sangh, the root of the BJP, Mr Advani said “our critics may be sarcastic on it but the fact is that our cultural nationalism is very old. Stressing on the need for “open government”, he asked the BJP Chief Ministers to adopt a “quadruple feedback strategy” towards the same. That is to take note of the suggestions of MLAs, bureaucracy, party and, most importantly, the public. Rajasthan Chief Minister Vasundhara Raje said steps taken by her government to tide over the financial crisis had succeeded and a special emphasis was being laid on ensuring food security, employment generation and development of disadvantaged sections, including women. Presenting Gujarat as a destination for global industrial investment, state Chief Minister Narendra Modi said the state which witnessed a 15 per cent GDP growth rate last fiscal was poised to become the petro capital of the country and said 34 developmental projects involving Rs 31,000 crore were under implementation. Continuing the BJP tirade against the Manmohan Singh-led UPA government at the Centre, former Madhya Pradesh Chief Minister Uma Bharti began her second day’s Tiranga Yatra, accusing the Centre of destroying the progress achieved during the past six years of the NDA rule. Talking to newspersons before resuming the yatra, she said she would pose a question to the Prime Minister every day during her yatra. 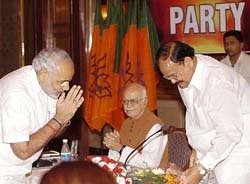 “In the history of India, Mr Advani was the first person who despite a chargesheet against him became a Union Minister. So it does not befit a man like him to talk about ministers with chargesheets,” he said. He accused the BJP of adopting double standards on the issue of “tainted ministers” and said that along with Mr Advani, two other former Union Ministers, Dr Murli Manohar Joshi and Ms Uma Bharti, were also made ministers despite a CBI chargesheet against them in the same case. It was the BJP which had stalled Parliament, set the precedent of inducting persons charged with henious crimes like rioting into the Union Ministry, he alleged. Commenting on the Union Railway Minister, Mr Laloo Prasad Yadav, becoming a Union Minister despite a CBI chargesheet, he said Mr Yadav had resigned as Chief Minister of Bihar the moment the charges were filed against him. He felt the country needed a law to prevent people with criminal antecedants to contest elections. Mr Reddy also ridiculed former Madhya Pradesh Chief Minister Uma Bharti’s “Tiranga Yatra” in Karnataka and said the BJP never approved the Tricolour. Talking about his ministry, Mr Reddy said within the next four years 4,000 FM radio stations would be built across the country with the participation of the private sector. He said the government at present would not allow foreign companies to set up FM radio stations in India. During his party’s conclave here on Friday, Mr Rao threatened to “drag Mrs Gandhi to the bazar” if statehood was not granted to the Telangana region, leading to an uproar in the state Congress. Realising that he had overshot himself, the Union Minister without a portfolio retracted his remarks and reiterated his faith in Mrs Gandhi. He said he believed that the Congress chief would fulfil the wishes of Telangana people. “Sonia is a great leader and a devi for the Telangana people. What I had said yesterday is not correct and I want no further discussion on the subject,” he told reporters. The already tenuous relationship between the samithi and the Andhra Pradesh Congress, allies in the state government, has further deteriorated with TRS chief’s remarks. “This is highly condemnable. KCR is a frustrated man. It’s a breach of trust to talk about any promise made at the highest level. If he wants to get out of the alliance, he is welcome to,” snubbed Mr D. Srinivas, APCC president and Rural Development Minister. KCR is known for extreme swings in his political moods and for his deliberate use of street language to appeal to the front Benches. “KCR has no business to talk such rubbish. He should remember that it was Sonia’s blessings that brought him to power,” Mr Srinivas, who played a key role in forging the pre-poll alliance between the TRS and the Congress, said. Though Mr Rao indulged in periodic outbursts as state Congressmen opposed to his growing influence with the Congress high command, this is the first time that he got carried away so much as to dare Mrs Gandhi. In fact, Congressmen in the state resent Mr Rao’s perceived rapport with Mrs Gandhi and have been sparing no efforts to portray him as an opportunist before the high command. Ironically, Mr Rao disclosed yesterday that Congress leaders in Delhi wanted him to campaign for the party in the Vidarbha region, where there was a demand for a separate state, for the coming Maharashtra Assembly poll. Special Judge Ravindra Maithani held that the recovery of these possessions were not relevant to the matter and, therefore, be handed over to Gupta’s wife. The order came on an application placed by Gupta’s lawyer seeking return of the recovered goods. The public prosecutor argued that the accused had earned this property through unfair means and the process of its seizure was on. But the court rejected the plea on the grounds that the orders for its seizure had not been obtained from the concerned officials. Owner of Neeraj clinic, R.K. Gupta was arrested on August 13 after being on the run for 10 days following a raid on his clinic in Rishikesh. Not even a registered practitioner, Gupta is facing the charges of duping patients by using high narcotic and psychotropic content in his ‘miraculous cure’ for epilepsy. The meeting came in the backdrop of the recent dramatic developments culminating in a High Court order on Friday restraining the police not to arrest a young leading hero Mahesh Babu and a senior director Gunasekhar till Monday in a case of kidnap and criminal trespass. The film industry delegation was led by stalwarts such as Chiranjeevi, Nagarjuna and Suresh Babu, in a show of support to Mahesh and to bring pressure on the government for tightening control over piracy. “The Chief Minister has assured us that the government will do everything to protect the film industry from the piracy threat,” Chiranjeevi said after the meeting with Mr Rajasekhara Reddy. Mahesh, who went to Warangal on Thursday along with the film’s director on a promotional tour, rounded up the video outlets on a tip-off from his fans that they were making pirated CDs of his film, made on a huge budget of Rs 20 crore. “Why should we make films with such huge costs, when people can watch it for Rs 10. It’s as good as killing the industry. And the joke is that they file cases against me for it, while those selling pirated CDs face no prosecution,” Mahesh, who also produced the film, said. While the Warangal SP K. Srinivasa Reddy said the case was serious as Mahesh had kidnapped a person from one of the video libraries, the Telugu Film Producers’ Council and Movie Artistes Association protested against the authority for letting off the accused. Meanwhile, Mr Srinath, who was alleged to have been kidnapped, appeared at the press conference and said he had come on his own to Hyderabad to provide details about the piracy racket to anti-piracy cell and that he was actually saved by Mahesh from his fans’ ire. Organisers of Ganpati pandals in Maharashtra have split on political lines on the eve of the elections in the state. While a section of organisers aligned with the Bharatiya Janata Party and the Shiv Sena are determined to portray Veer Savarkar and Uma Bharti in their tableaus, others have decided not to do so. Days after Ganesh mandals backed by the two Hindutva parties announced the portrayal of Savarkar, the Congress-NCP led government in Maharashtra warned them against creating law and order problems. The Mumbai police has already issued an order asking Ganesh mandals not to depict the Veer Savarkar controversy in their tableaus. With the Election Commission also coming down heavily on political campaigning at religious festivals, the police is on alert to take action against organisers if provocative speeches were made at Ganesh pandals. The ruling parties in Maharashtra were also active behind the scenes to downplay the two controversial issues. On Saturday, more than 1,000 Ganesh mandals in Mumbai came together to pledge that they would refrain from political controversies. “We have asked all Ganesh mandals to stay away from sensitive issues as we want a peaceful festival,” said Pandurang Jadhav, an office-bearer of the Sarvajanik Ganesh Samiti, a body of Ganesh festival organisers. Traditionally, the Ganesh festival has seen politicians put up pandals on street corners and in open grounds since a large number of people in the state flock here every evening. 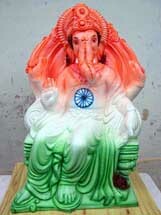 In all there are 4,500 Ganesh mandals in Mumbai most of which depict current issues in their tableaus. However a few mandals with strong political backing have decided to go ahead with displays of Savarkar. The Nivedita Sarvajanik Ganeshotsav Mitra Mandal at Andheri said it would depict the life and struggle of Veer Savarkar. “We will go ahead despite the police directive,” said Surendra Dube, chairman of the mandal. Union Environment Minister A. Raja, however, extolled the virtues of the less than four-month-old UPA government and said during this short period, the government had exploded the myth that environmental clearance was a time-consuming and uphill task. He also outlined a proposal to delegate more responsibilities to state governments for granting environmental clearance regarding certain categories of projects and the introduction of a system of accreditation for consultants and experts to prepare environmental management plans and conducting public hearings. It may be mentioned that the Environmental Impact Assessment (EIA) notification, issued in July, makes it mandatory for the Centre to grant environmental clearance to all new projects over Rs 50 crore, constructions meant for more than 1,000 persons or discharging sewage of 50,000 litres daily. The ministers were meeting at a conference of state environment minister, state environment secretaries and chairpersons of state pollution control boards, held after a gap of nearly four years. Delegates from different states, including Punjab and Haryana, raised objections to environmental clearance proposals, saying these were not acceptable to them. There are projects, as old as three to four years, still confined to files, thanks to the cumbersome process, a state pollution control board official said, adding that the power of listing projects in “A”, “B”, or “A/B” categories would still be with the Centre. The process of reforms in environmental clearance should be simplified with the spirit of decentralisation, the delegates said. No autonomy was guaranteed for states as the deciding authority on which projects would fall in the “B” category, listed for states’ approval, was vested in the Centre Punjab and Haryana, represented by their respective environment secretaries and pollution control board officials, also opposed the EIA notification, stressing that the entire process needed to be decentralised and should be time-bound. State governments were well equipped to tackle the issue, Haryana Environment Secretary D.S. Dhesi told TNS. Earlier, no residential colony or estate required any clearance from the Centre, he added. He urged the states which had not so far set up state bio-diversity boards, to set up one immediately and said the government was in the process of formulation of a comprehensive strategy for the conservation and management of wetlands and send their views on the draft national environment policy on or before October 15. The proposed changes also limit the number of activities requiring clearance from the Union Ministry of Environment and Forests to 19 and limit the time period for obtaining final clearance up to 12 months with ensured certainty. With the issuance of notification, filing of nomination would begin and last date for filing nomination is September 20, followed by scrutiny of the papers the next day. The last date for withdrawal of candidatures is September 23 and polling is scheduled for October 7. Repolling, if ordered by the Election Commission, will be held on October 9 and counting of votes will take place on October 10. The electoral rolls of Arunachal have already been summarily revised with January 1, 2004, as the qualifying date except in four assembly constituencies of Dormukh, Chowkiskm, Borbomas Biyum and Miao where they were revised with the cut off date being January 1, 2003. Commission officials said electronic voting machines (EVMs) will be used for polling in all constituencies. The 11-member Indian team will be led by Mr V.K. Duggal, Secretary, Ministry of Water Resources. During the pervious meeting of the JEC, which was held in Delhi in January this year, an Indo-Bangladesh Joint Technical Group was constituted to examine all pending issues. Samajwadi Party workers today burnt an effigy of Railway Minister Laloo Prasad Yadav protesting his alleged derogatory remarks against party General Secretary Amar Singh. Raising anti-Laloo slogans, scores of SP workers assembled near the Vidhan Bhavan and burnt Yadav’s effigy.